Here is a nice set of windows recently installed at Pitts Baptist Church in Pitts Georgia. The windows were an opalescent design with 16" x 22" Life of Christ medallions. They also recieved Aluminum Frames and Protective covering. Check out the new protective covering and repair work at Queen Street United Methodist Church in Kinston, NC! Check out the new opalescent glass windows at House of Prayer Deliverance in Varnville, SC! Check out the opalescent glass windows at Salem United Methodist Church in Rose Hill, NC! Check out the opalescent glass windows at Mt. Olive Holiness Church in Colquitt, GA! Check out the opalescent glass windows at Little Mill Baptist Church in Willington, SC! Check out the opalescent glass windows at Mt. Vernon Holiness Church in Seneca, SC! 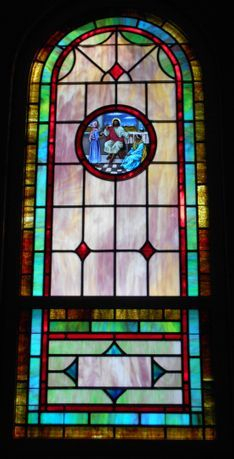 Check out the cathedral glass windows at Calvary United Methodist Church in Swansea, SC! Check out the opalescent glass windows at Orange Grove Baptist Church in St. Helena Island, SC!